Waking up in the morning with neck pain is just one of the worst ways to start the day. But neck pain is so easy to solve as it’s so often caused by a bad pillow! So I put together this guide on the best pillows for neck pain so you can start dealing with yours straight away. I’ve got a quick summary of all the pillows that got reviewed so you can check it out. My personal Favourite is the Panda Pillow. Morning neck pain is mainly caused from your pillow, there can be other factors involved so if you a new pillow doesn’t help definitely head to your doctor for more advice. If it is the pillow what happens is you don’t have enough support to keep your head in place so it droops. And when it droops it puts a lot of stress on your neck and your shoulders causing you to wake up with neck pain. Have a look at this diagram to see what I mean. But what causes the pillow to do that? It’s normally one of two things. Old pillows have gone through a lot. Countless nights of being squashed down by your head will have left them flat, lifeless and in need of retirement. For a gauge, pillows normally need to be replaced every 1-2 years, of your pillows older than that then it’s time for an upgrade! ‘But my pillows aren’t old!’ I hear your cry. Well you also need to have the right type of pillow. If it’s too soft then it won’t give you any support and if it’s too tall it’ll still cause your neck to twist slightly. Generally there’s only one best filling that’s going to sort out your neck pain and that’s Memory Foam. When you put your head on memory foam it softens slightly letting your head sink into it. This means your head gets perfectly cradled and your neck has the perfect alignment leaving you with supreme support and comfort. But another great alternative is latex. Latex is similar to memory foam but a little firmer and plumper. It also tends to be more expensive but some people prefer it. 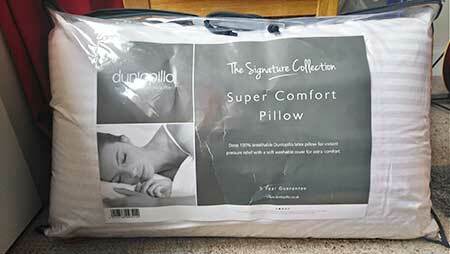 Finally you have synthetic pillows which are normally not ideal for neck pain as they tend to be too soft but if you get some high-quality ones that are nice and plump they can do a good job. Now it’s time for the main event! I’ve gathered and reviewed some of the best pillows for neck pain. They’re each linked through to where you can buy them so just click the Price and reviews button for more info. The panda pillow isn’t directly designed for neck pain but it’s really comfortable memory foam so it’ll do a great job at sorting out neck pain. The best thing is that it has a whopping 10-year guarantee! 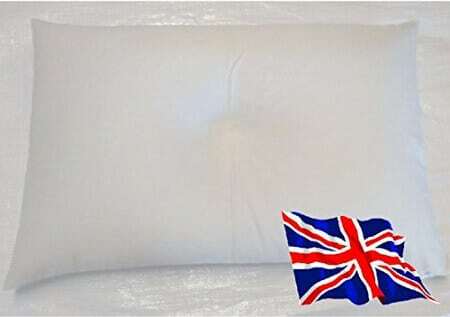 Pillows normally last about 1-2 years so this is really great value. The cover is bamboo which is breathable so stops your head getting sweaty and so stops you rolling around, so you can keep your neck still letting it fully relax. It’s also washable! Panda Life also donate some of their profits to preserving nature sanctuaries which is a nice touch. Latex is another great choice for neck pain, it’s a little bouncier than memory foam and provides great neck support. Latex is also completely natural and long-lasting, Dunlopillo have put a 5-year guarantee on this pillow which isn’t to be sniffed at. It’s really plump so great for side sleepers but may be a little high for side sleepers. A fantastic pillow, a great choice if you have neck pain. Plump and the only pillow you’ll need. 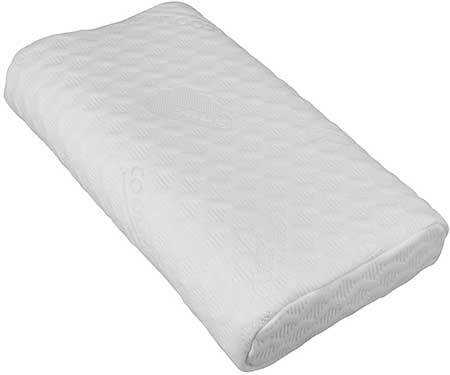 This is similar to the Tempur contour pillow you can buy but it’s much more affordable. The contour shape helps to cradle your head so all the weight is taken of your neck and it can fully relax. They can be really comfortable but a lot of people struggle with getting used to the actual shape. And they don’t fit in normal pillowcases which some people find a pain. 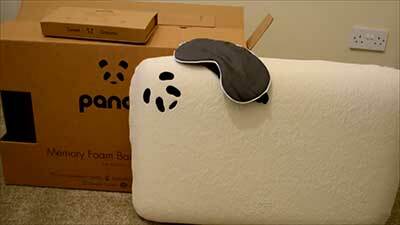 But if you can get used to it the Snug Contour pillow is one of the best you can get for neck pain. Plus it comes with a Coolmax cover which helps keep your head cool through the night. Overall, A great contour pillow for neck pain, good support but a strange shape to get used too. This pillow is a really nice, large sized pillow, all packed into a super soft bamboo cover. 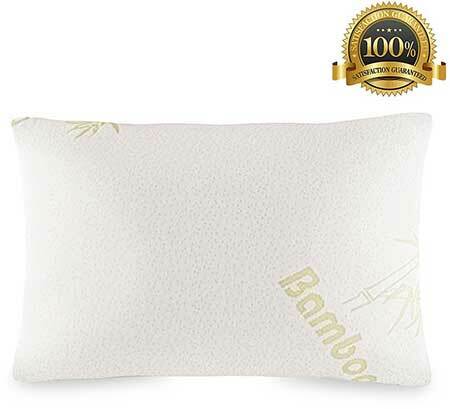 Bamboo is also hypoallergenic and breathable so this pillow stays nice and soft. The shredded memory foam is softer than normal memory foam because it’s a bit more pliable. The problem with that is that it doesn’t spring back into shape very well so you have to re-plump it each night. The large size also means that it won’t fit into a normal pillowcase so you’ll have to buy an oversized one to fit it. But it does come in the pillowcase as shown in the photo so it’s just if you want something different. Will it help with neck pain? It will, it’s definitely not the absolute best but if you want a softer pillow to help with mild neck pain. Buckwheat husks are a byproduct of farming buckwheat and when they are triple cleaned like these ones they provide phenomenal support. They are small enough that they feel super comfortable and they just mould to your head. Brow farm also grow their own buckwheat husks right here in the UK. The pillows themselves are very heavy and when you move around they do make a noise but that is a small matter to contend with how great a pillow this is. A completely natural and organic pillow that provides great support and comfort. I only have good things to say about this pillow. DO I NEED A PILLOWCASE FOR MY CONTOUR PILLOW? Nope, both pillows recommended here come with removable washable covers that have a zip. So you can wash them just like you do when you wash the rest of your bedding. WHAT ELSE CAN I DO TO STOP WAKING UP WITH NECK PAIN? Each night you want to adjust your pillows to stop them bunching up to the end of the bed. Doing that will only cause your neck to tilt uncomfortably which will worsen your neck pain. So you want to make sure they are lying flat when you go to bed. HOW MANY PILLOWS IS RIGHT? It depends on the pillow and the size of the person but generally a single memory foam pillow will do. If you need it raised you can put an ordinary pillow underneath. Side sleepers with broader shoulders will also need a higher pillow to keep their neck aligned. Changing to a memory foam pillow made a huge difference to my neck and back pain, which I’d suffered with for years – but didn’t cure it. 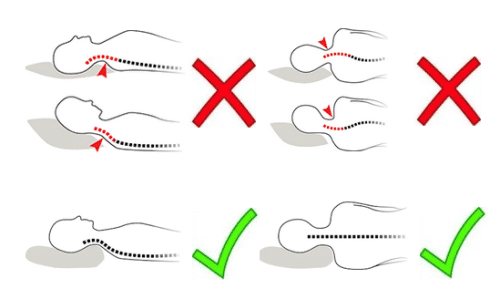 However, last year, a physio also told me that side sleepers should sleep with a pillow between their knees – doesn’t need to be an expensive one, but plump enough to keep your top leg aligned with your hip. The combination of this and using a memory foam pillow for my head has literally taken 15 years off how I feel in the mornings! Wish I’d been given these simple solutions in my early 30s when the problems started…!